This, my dears, is a beautiful yarn bowl that I ordered from June over at Rising Sun Earthworks. I really wanted one as a decorative piece to keep my yarn from rolling around, and found her through Ravelry. 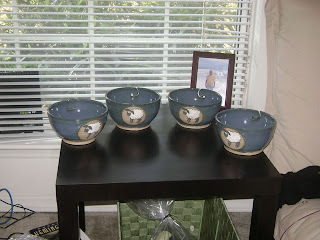 The yarn bowls that I saw on her site were originally without the sheep design. 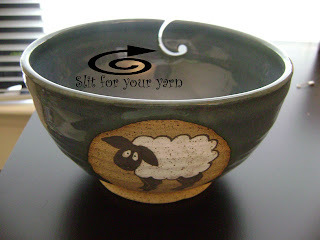 However, I saw a mug she made with the sheep design on it and asked her if she can make a yarn bowl like the mug. She happily obliged. Here it is in action. 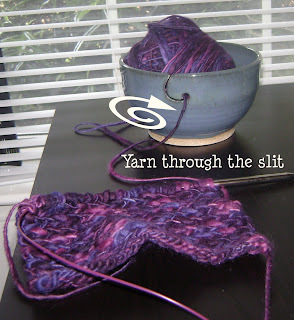 The yarn is well behaved in the bowl, while the working strand is guided through the slit. I'm so happy about my new toy. What can be better than that? Now folks, I'm not going to keep all of them...Only one. I'm planning to spread the yarn bowl love. When I saw these, I really thought that they would make great gifts for the ladies who sent me birthday gifts this year. One of them is going to Printrina, the one who gave me this wonderful gift for my birthday. Another one is going to Sandra, who gave me the gift of chocolate, fiber and song. They were so generous that I HAD to get these for them. I hope you enjoy them, ladies. So, that leaves one bowl to share. I'll tell you who's getting that later. Before I end this post, I wanted to tell you guys how great it was to work with June. She answered all my e-mails and stayed in contact with me about her progress on the bowls. After I sent her payment, the bowls were at my doorstep 2 days later. FYI, it took one month for her to make these.